After hearing so much about Lunasia I finally decided to brave the long lines to see what all the hubbub was about. Despite arriving just before 11:00, there was already a crowd in the waiting area and we had to wait over an hour for a table to open up. The meat was fairly tender but there was a fair amount of fat which meant that despite despite being a bit light on the black beans the ribs bore a pretty good flavor nonetheless. 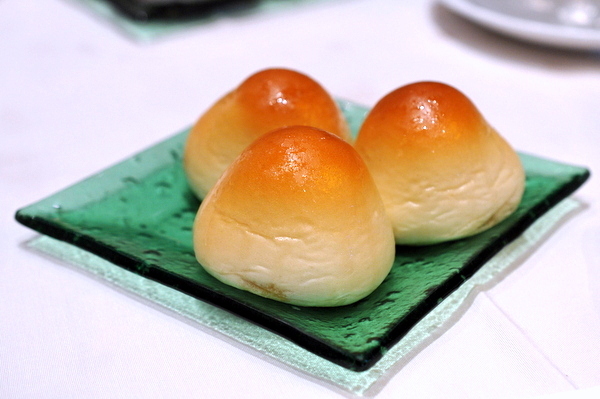 Lunasia really excelled with their baked pork buns. The freshly baked bread was thin and delicate with a golden glaze and the cavity inside is completely stuffed with sweet BBQ pork. Like the preceeding buns these dumplings came stuffed full of seasoned pork. 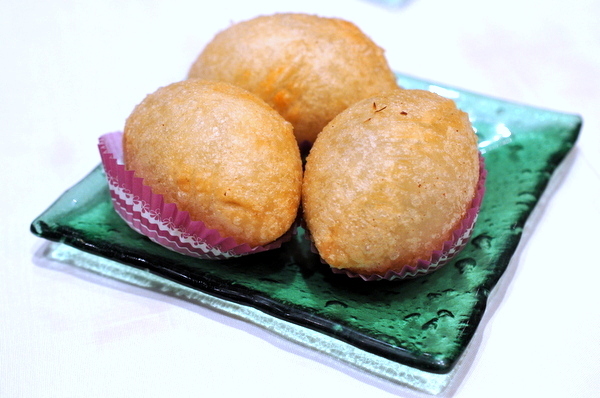 The skin was a touch too sweet but the fried glutinous rice had both a crisp exterior and dense toothsome interior. 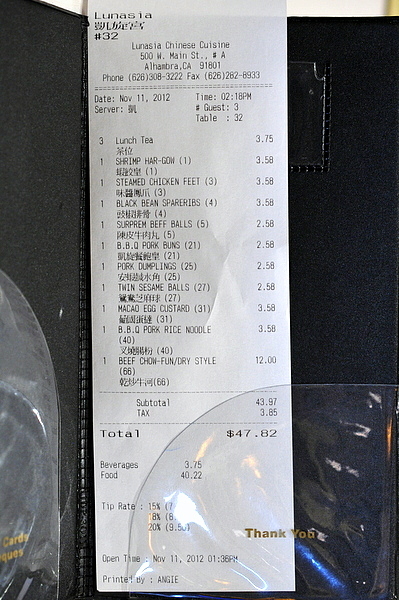 High end dim-sum restaurants tend to eschew push carts in favor of ordering from a menu which wouldn't bother me but for their consistent inability to save the sweets for the end of the meal. 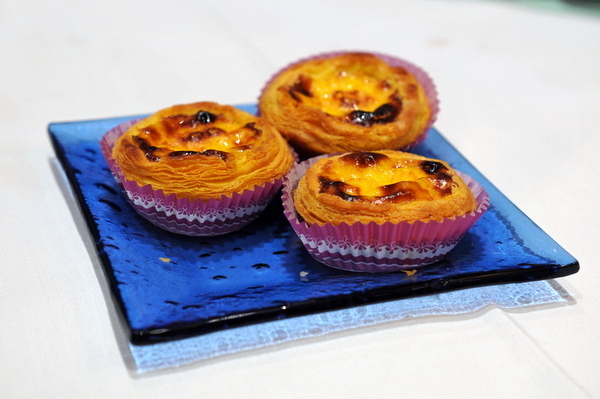 The Macao egg custard wasn't the richest that I'd had but it was freshly baked with delightfully flaky crust. 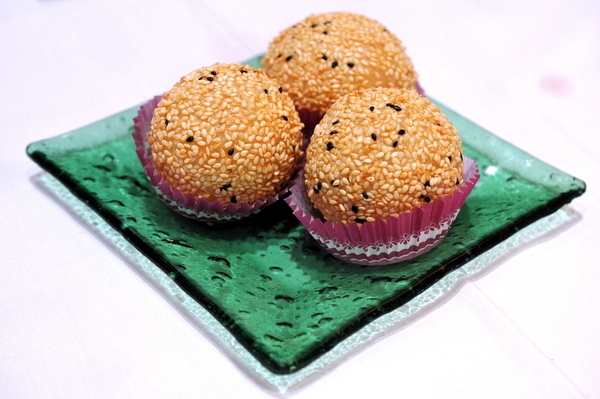 Another dessert staple, these dense sticky balls are filled with a sandy sweet lotus paste. 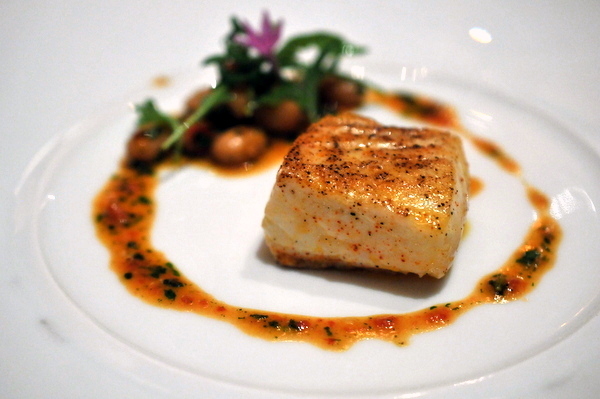 For me this dish is all about balance. 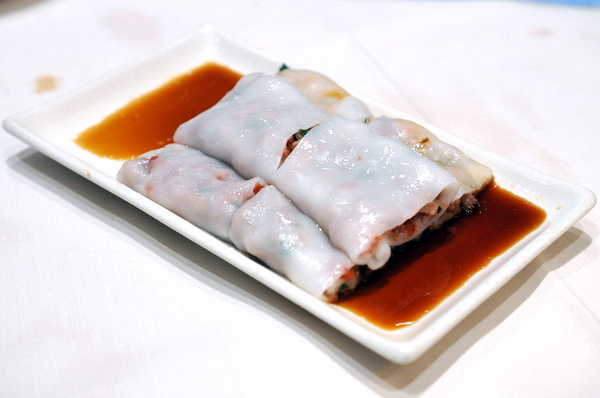 Many preparations, Lunasia's included, feature too much glutinous rice noodle which makes the dish taste bland despite the porcine filling and pool of soy sauce. 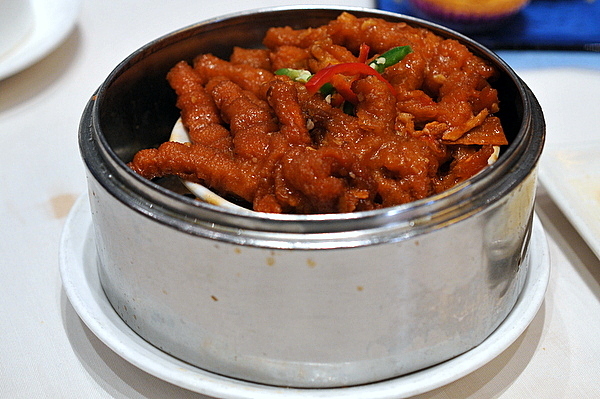 Despite having one of the more labor intensive and intricate preparations, the chicken feet tends to be one of the more consistent varieties of dim sum across various restaurants. 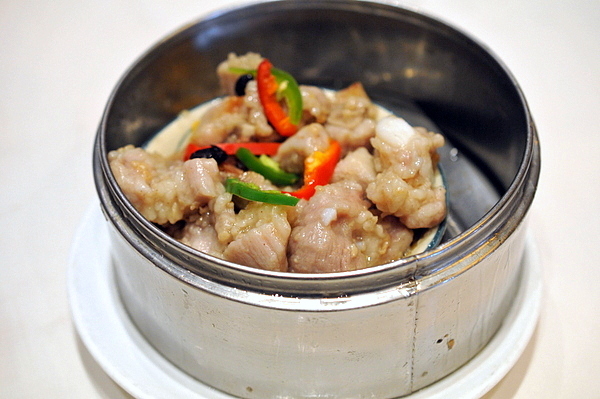 The skin on the feet is fried, steamed, and stewed to a fleshy tenderness then drenched in a dark savory sweet sauce. 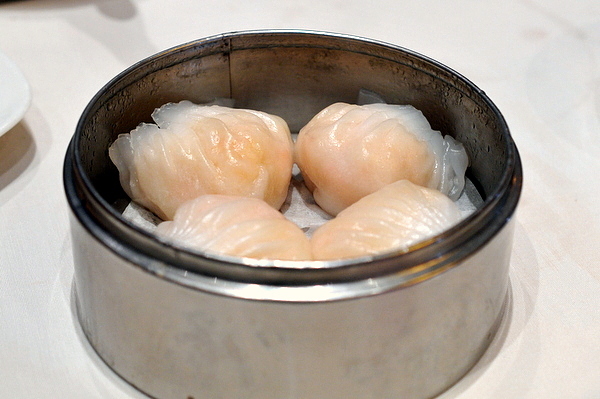 Though Lunasia is known for its dim sum, we wanted to try some of their regular dishes as well. 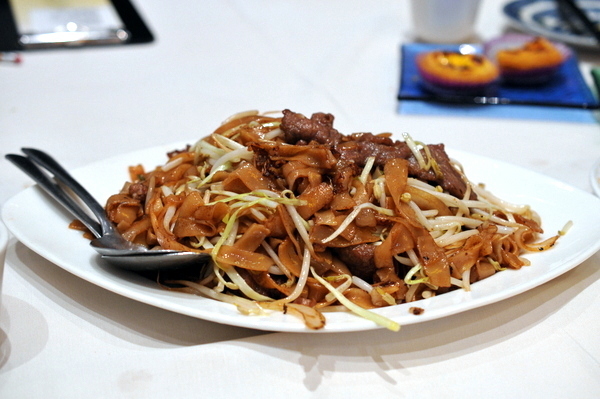 Though the beef was a touch gristly, the noodles were nicely cooked their chewy supple texture was augmented with a weighty wok-fired char. 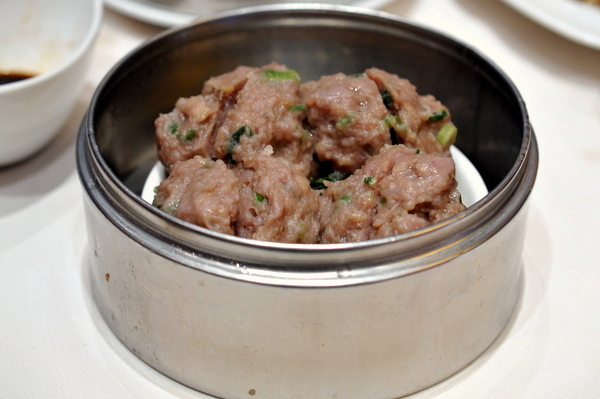 Har Gow is often used as the yardstick to measure a chef's skill. Ideally the skin is thin and translucent but strong enough to hold the filling without breaking or sticking. 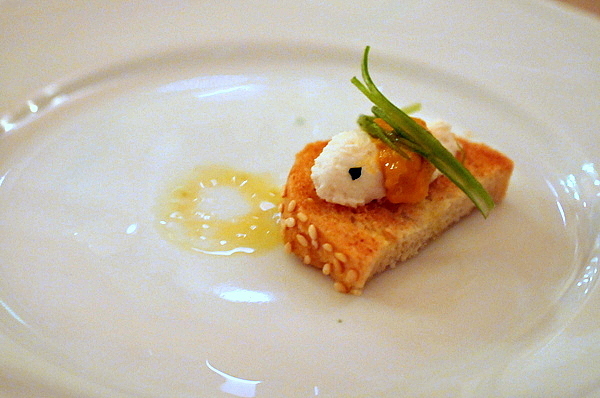 Unfortunately Lunasia's fell short on this account though the texture of the shrimp was spot on. Vaguely disturbing name aside these were actually pretty tasty. 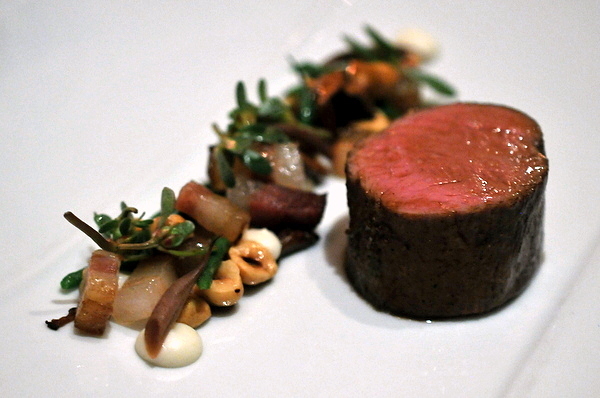 The meat has a spongy texture and is studded with bits of onion and cilantro giving the meat a herby twang. Though there were some nitpicks, I came away very impressed with Lunasia's dim sum service which certainly deserves its place among the SGV's elite. 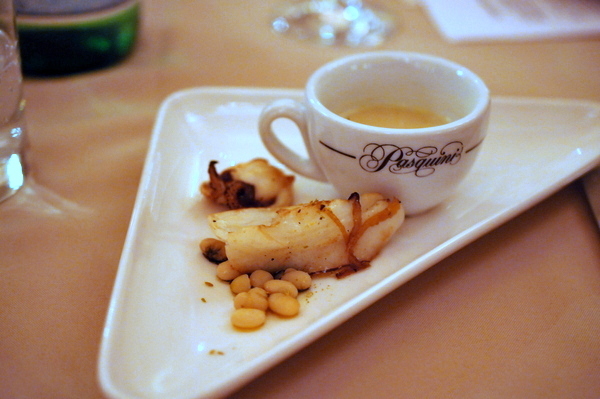 In 1972 Piero Selvaggio took partnered with a friend to bring gourmet Italian food to Los Angeles. Over the following 40 years Selvaggio turned a miniscule initial investment of $4,500 into a multi-million dollar restaurant empire that helped define modern Italian cuisine in America. 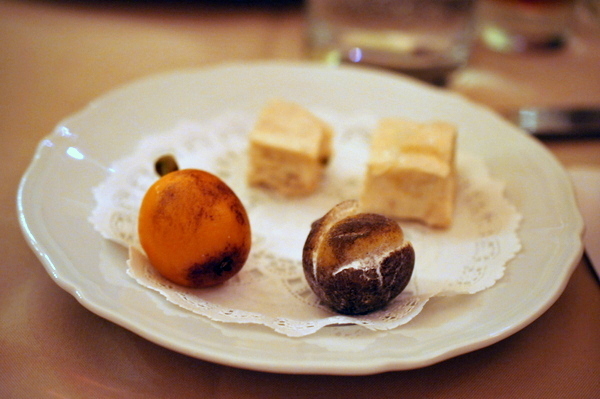 When I first heard that Valentino would be offering a 40-course menu to celebrate their 40th anniversary, my first reaction was sheer disbelief especially when I learned the menu would feature Sicilian/Sardinian cuisine of Selvaggio's youth rather than the Northern fare the restaurant normally serves. 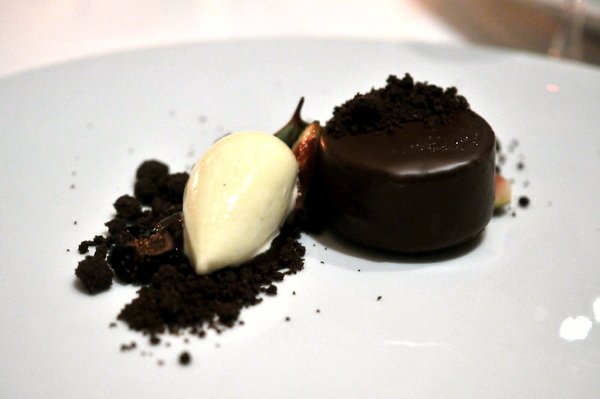 A one-night only tasting menu is hard enough to pull off and one this extensive with unfamiliar dishes would be a logistical nightmare for any staff. If that wasn't enough, they were also offering an optional wine pairing featuring 2-ounce pours of 40+ Italian wines (roughly 3 bottles worth) that had me fearing for my life. 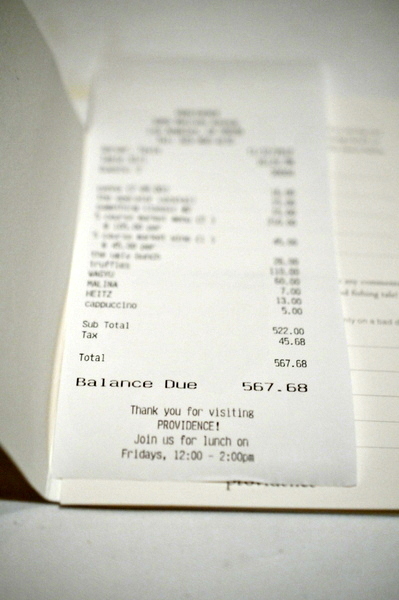 Still, despite all my reservations, I couldn't pass up a meal this extravagant. The meal got off to a great start with delicate curls of tender eggplant filled with onions and cheese. 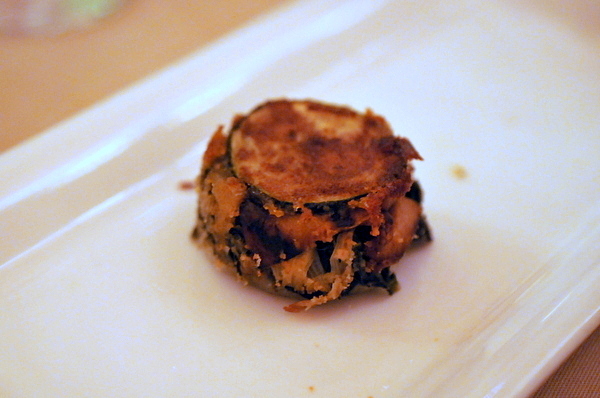 The sweet savor of the caramelized onions provided a lovely contrast to the twang of the eggplant though the combination was a bit one-note texturally. 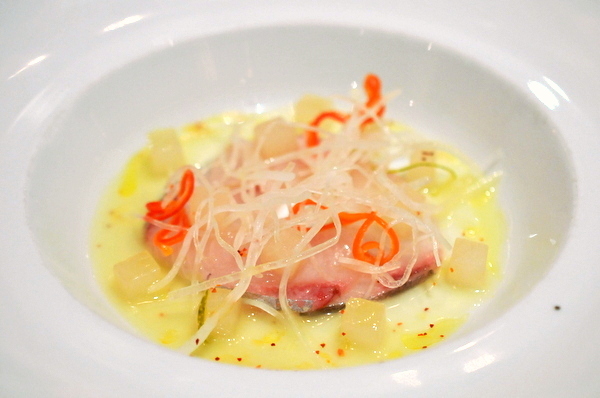 The meal had a number of service gaffes beginning with the presentation of the crudo. 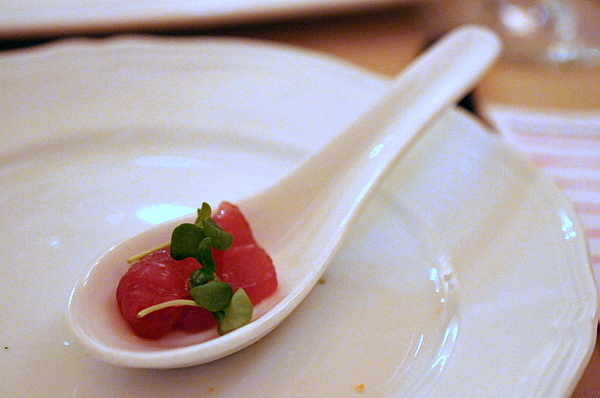 The tuna was completely unadorned which suggests it may not have been finished. 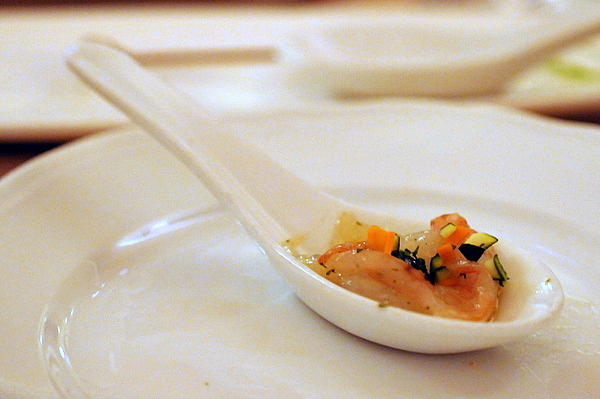 The other spoon held a raw spot prawn which while tasty didn't fit the description above either. The panalle was definitely the more interesting of the duo, the dry crumbly texture and creeping savor was a bit odd at first but grew on me. 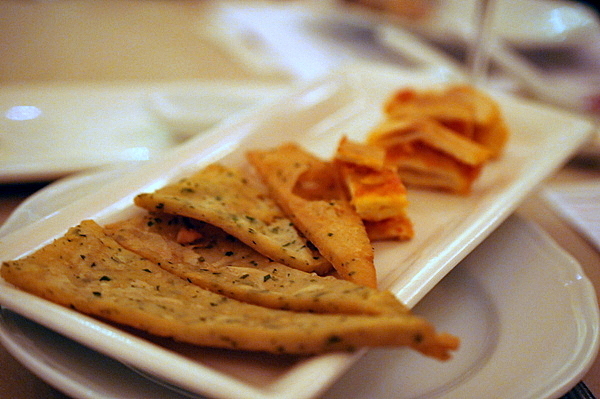 The focacce had a more classically Italian flavor with fresh tomato and a pungent cheesiness. 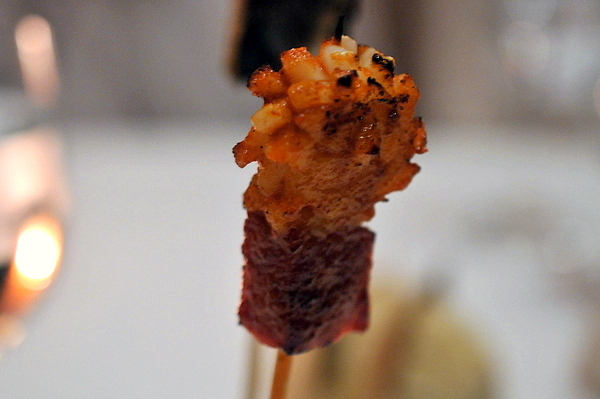 I was expecting something like a yakitori skewer and while the tender texture was quite enjoyable, the flavor was a touch bland. 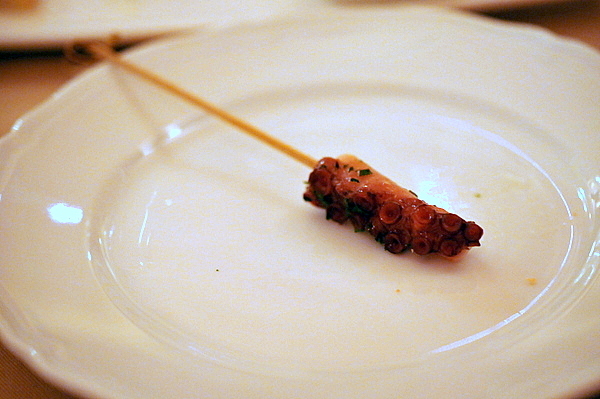 The stuffed calamari was a huge step up from the octopus. 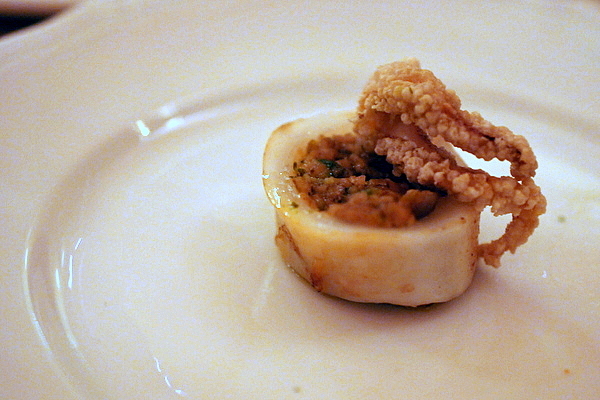 The ring of squid gives the bite a dense textural base while the core provides a dark earthiness punctuated with the crunchy savor of the fried squid. 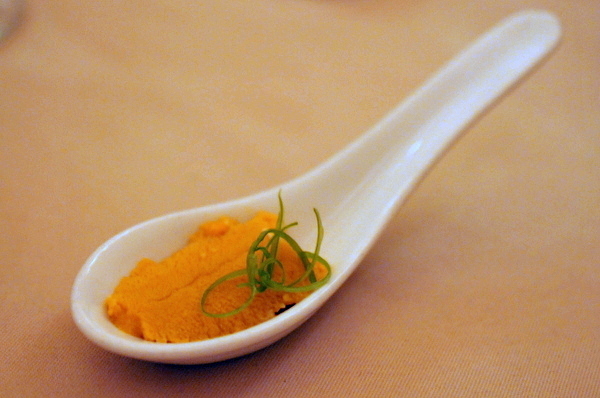 I was a bit unsure about the combination of cheese and sea urchin, but the uni permeated the mild cheese which in turn tempered the rich brine of the roe. 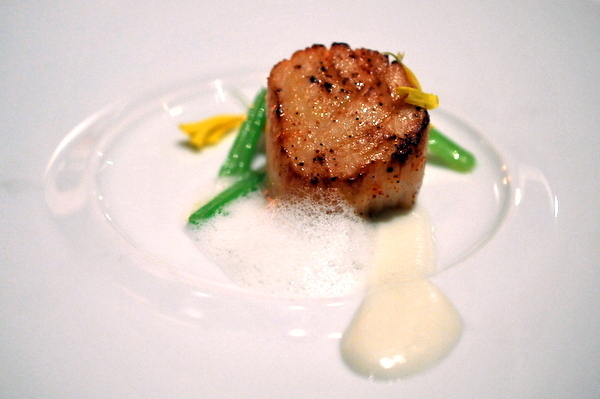 The Seppie was the strongest of the three cephalopod dishes with its dense supple texture and beautifully nuanced brine. 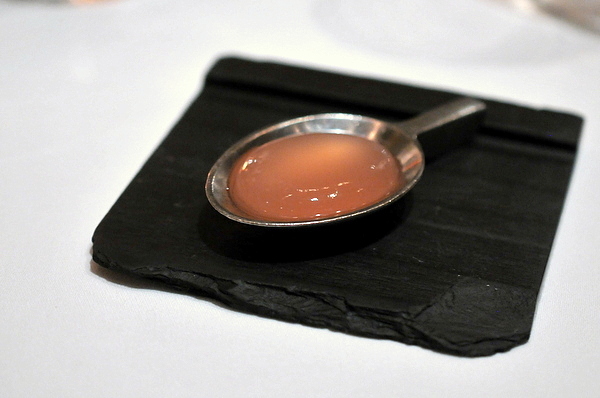 Though I'm not a huge fan of favas I quite enjoyed the intense smoky tang of this particular preparation. 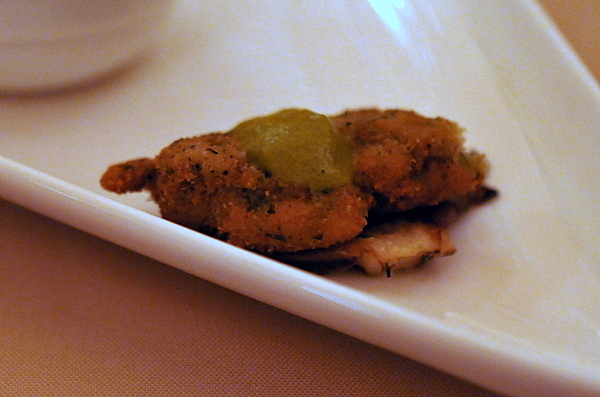 The fritter was firmer than the previous preparations of brain that I'd tried, texturally reminiscent of sauteed sweetbreads. The deep earthines of the mushrooms intertwines beautifully tempering the metallic tang of the brain while heightening the offal's richness. 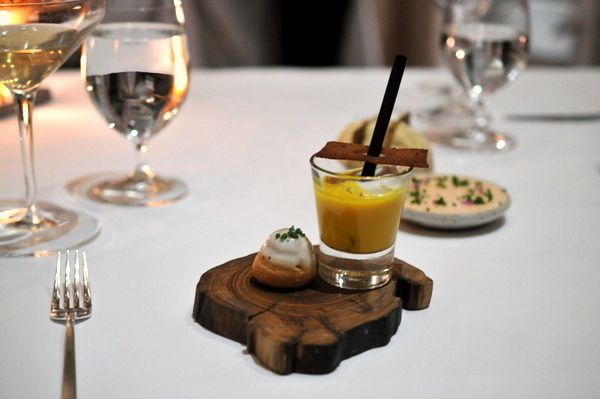 This soup was probably my favorite course of the evening. 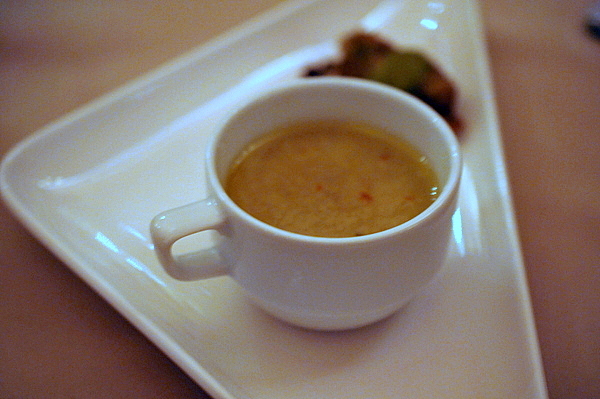 Lurking within the broth is imbued with an intense brine from the clams mixed with a light bitter herbaceousness from the saffron. 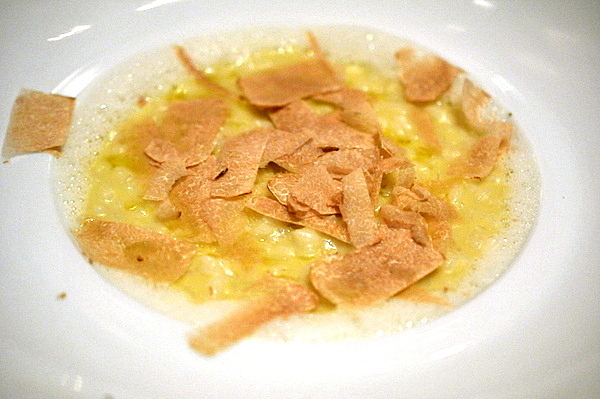 Beneath the placid surface of the broth is a mound of couscous which gave the dish a toothsome weighty texture. 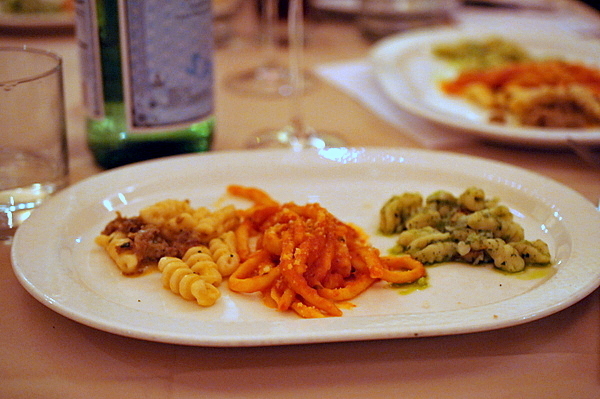 The trio of Sicilian pastas was a bit light for my tastes. 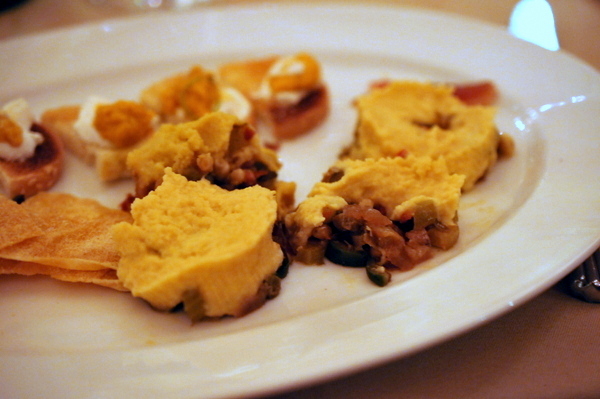 Aside from a dollop of uni there was no meat on the plate. The busiate and penette both had a keen astringency though the almond in the former acted as a moderating effect. 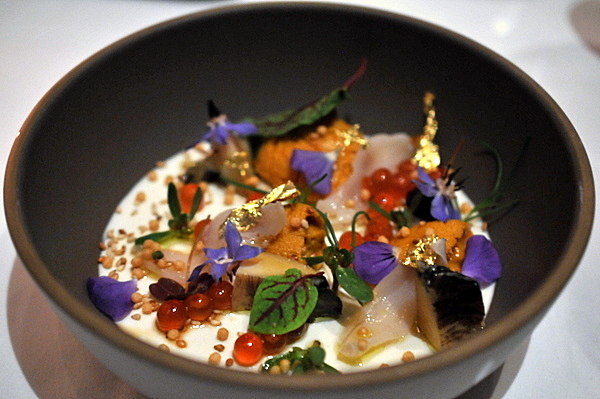 Like with the crostini, the urchin saturates the creamy rice; beautiful in conjunction with the delicate orange blossom. 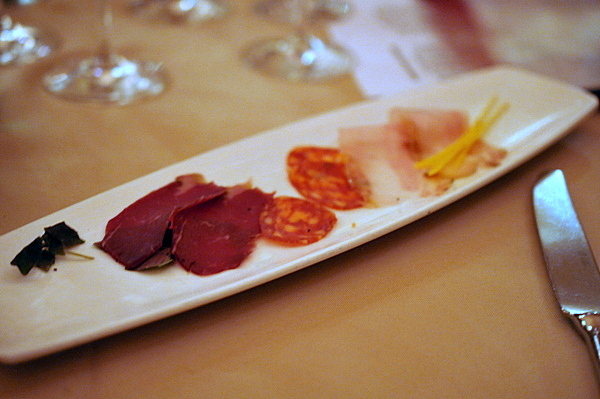 These three charcuterie courses constituted the main body of the Sardinian Antipasto. 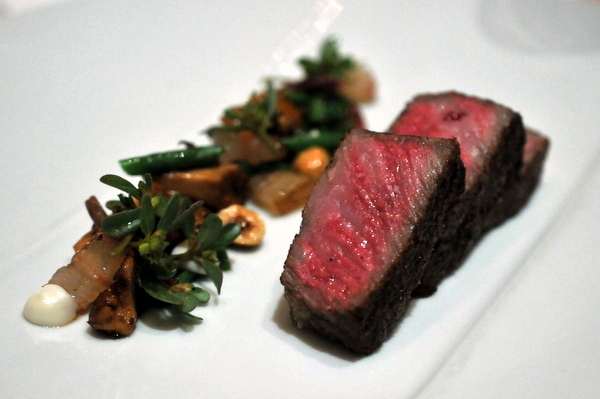 The Anzone had a robust rustic lambiness and smooth soft texture. 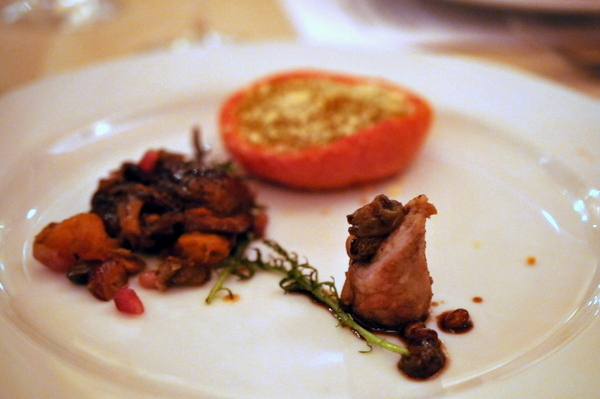 The Sartizza was my favorite with a fierce spiciness to go along with its salty porcine sapor. The guanciale was almost like a gauzy veil of salted fat that oozed oil with each bite. 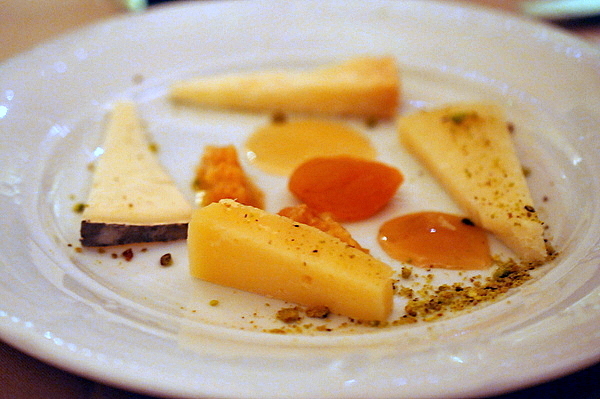 Bottarga is definitely an acquired taste though the sweet fishiness is growing on me. 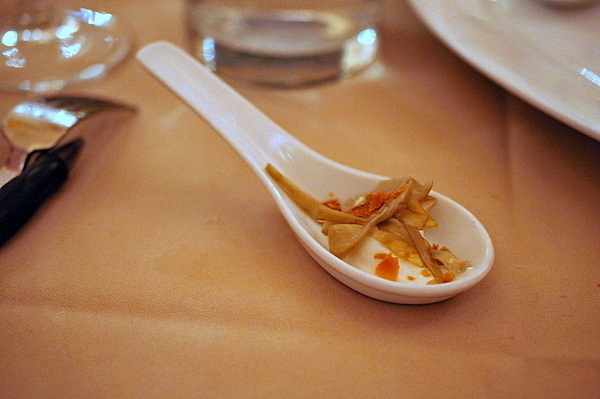 The pungency was a nice addition to the mellowness of the artichokes. I was expecting a bit more structure to the omelet, but the gritty texture reminded me of dry mashed potatoes than eggs. 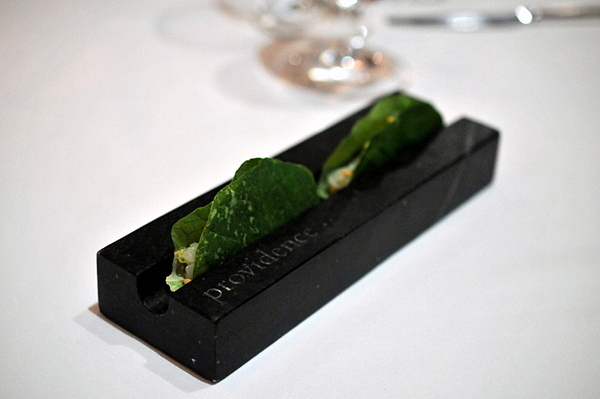 The greens and potatoes provided depth a pleasing if humble depth of flavor. The mullet was supposed to come with more ricotta but a mix-up in the kitchen left us with four thin slivers of the smoky ham-like fish sans adornment. I didn't think much of this course but it turned out to be much better than I expected. 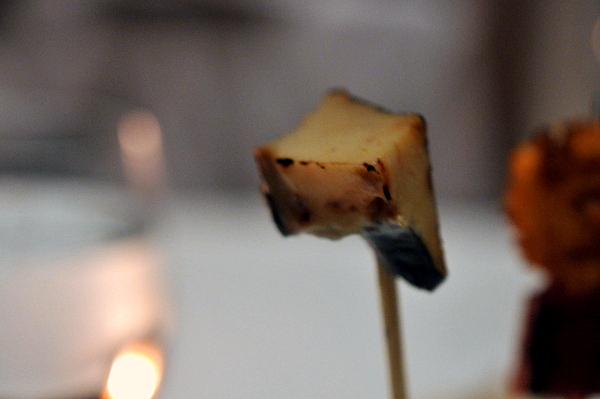 The grilled vegetables had a fairly weighty savor augmented by the sharp tang of the cheese. 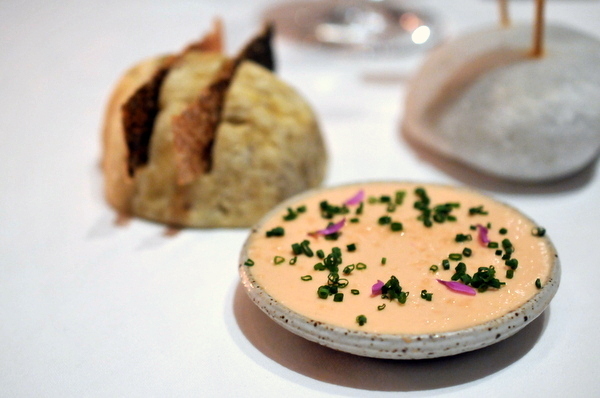 A comedy of errors surrounded this course with the kitchen bringing the crostino numerous times before finally bringing us the correct dish, which basically amounted to raw sea urchin roe in a spoon. For the most part the Sicilian and Sardinian courses had been evenly matched but the Sardinian pastas were far superior. The busa was the least impressive though the dense noodles and bright acidity of the tomatoes made for an enjoyable contrast. 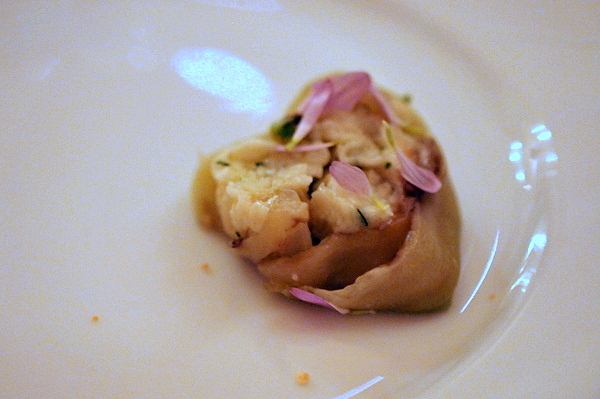 The punzu had the verdant zest of the Sicilian Busiate but with an additional nuance from the crab. 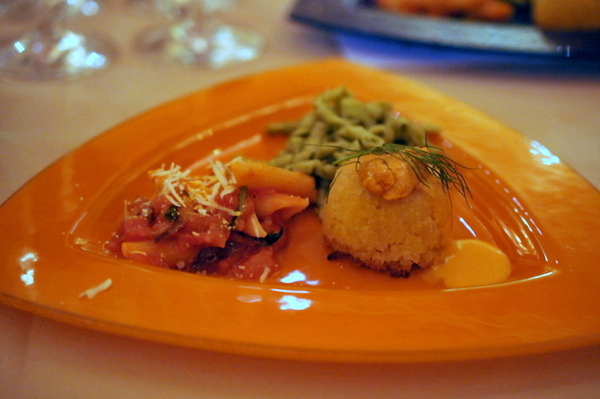 The Malloreddos was easily the best of the pastas thanks to the blend of rich porcine sapor and exotic saffron. 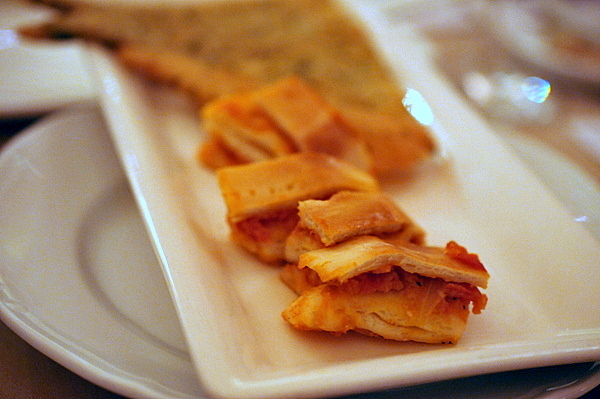 So far the Sardinian dishes have been heavier than their Sicilian counterparts but their roles were reversed for the entrees. The suckling pig was lightly seasoned letting the natural flavor of the meat shine through, though I would have preferred a moister texture and perhaps more skin and fat. 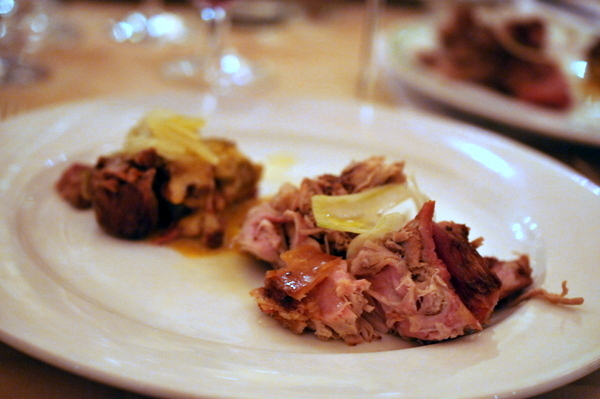 The braised lamb was much more robust, but tame when compared to the belly. The cheese selection didn't really do much for me. Personall I prefer richer softer varieties but these ran towards the firmer textures and milder flavors. The meal ended with a bonanza of sweets. 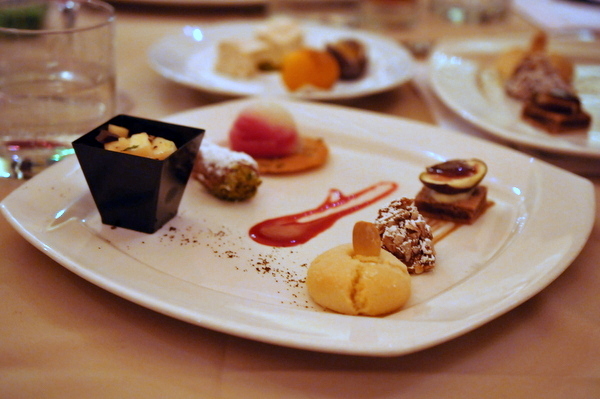 Unlike the rest of the meal which was evenly balanced, there were two more Sicilian offerings for the desserts. The standouts for me were the cannolicchi with its simple buttery crust and lightly sweet filling and the amaretti de oristano with its light almond flavor and dense chewy texture. 40 courses and 40 wines was a bit ambitious to say the least. 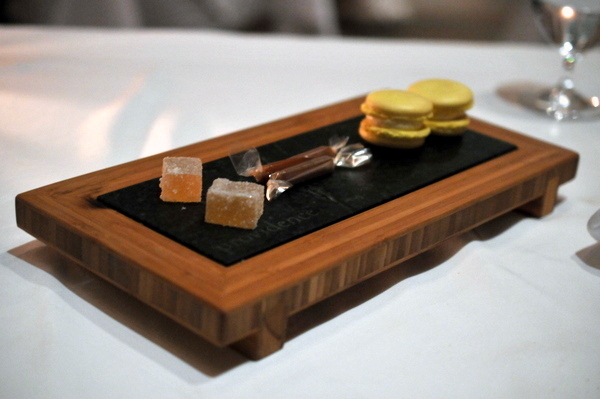 The meal got off to a rocky start with the kitchen forgetting to serve us 9 courses. Only after we got to the pastas did we realize we hadn't had nearly half the stuzzichini and antipasti. Similarly the staff lost track of which wine we were on a couple of times, though I believe those mistakes always ended in our favor. 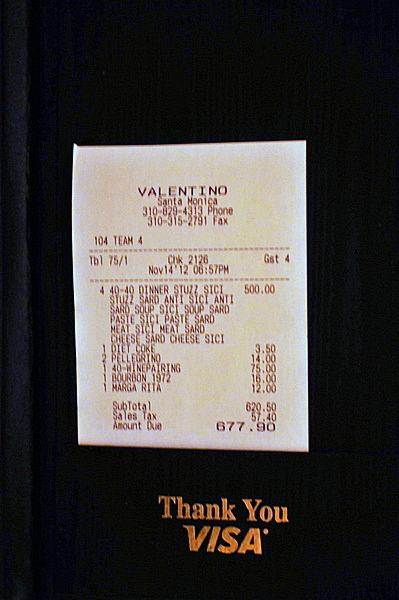 Despite the service gaffes, Valentino shone where it counted: the food; clearly there is yet life left in these old bones.